I don't know who had the idea of the rabbits...Rabbits? Why did we have to take in hundreds of rabbits to protect ourselves? 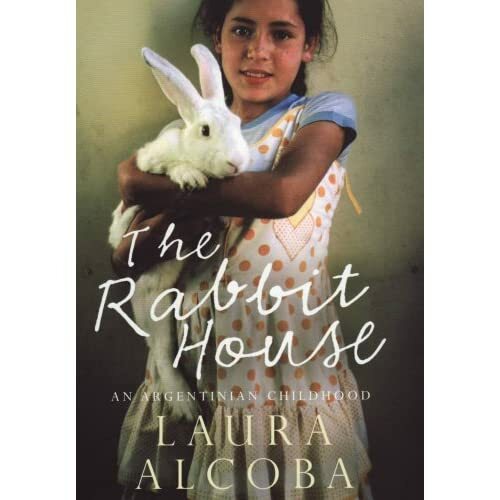 The Rabbit House is Laura Alcoba's attempt to explain her childhood, or lack of it. Until she was ten years old, Laura lived in Argentina. But because her parents were militants, members of the banned Montoneros organization, she has pieced together her memories without the help of family photos, or school friends. This was a childhood of life-or-death secrets: a printing press hidden behind rabbit hutches; a father in prison; and a mother who hid under bright red wigs. The book describes a transitional life, moving from one safe house to the next, and from one surname to another until, when the fashionable yet friendly neighbour asks Laura her name, she cannot think what to say. I said only 'Laura' because I know that this is the only part of my name that they let me keep. Straightaway, she asked me, 'Laura who?' And truthfully, I don't remember what came next. I must have started to panic, because I know very well that there is a warrant out for my mother, and that we are waiting for them to give us a new name and false documents...What is, after all, my name? In my tutorial today, we talked about how even (especially?) the most idealistic movements betray themselves, giving into violence and fear, and demonstrating an abject failure to care for and protect their members, especially those lower down the scale. Murder and kidnapping are always inexcusable. But state murder and kidnapping, that uses the instruments of the State - the armed forces, medical profession, church leadership and judiciary - against its own people, must be judged with even greater severity. Such are the conversations we have here, as we watch the long-awaited trials of military generals, who, thirty years on, still claim torture, murder and kidnapping are legitimate tools of the State. Laura Alcoba's testimony ends with her search for Clara Anahí, the baby of the couple her and her mother lived with in the rabbit house, who is suspected to have been illegally adopted following the murder of her parents in 1976. The recent review in the Guardian notes that several thirty-two year old women have come forward since the book was published, wanting to establish if they are the missing Clara Anahí. Both Laura Alcoba and the still missing Clara Anahí must piece together their childhood, out of the silences and secrets, the missing photos and false names. There is still much truth to be told in this land. There is still much truth to be told in every land. The Rabbit House was published in English this month and is available on Amazon. Photo of Clara Anahí with her mother, Diana Teruggi.